The Pinnacle Association is serious about stewarding the land acquired over the years, now 1820 acres of forestland. While part of the mission of the Pinnacle Association is to acquire and protect land with a conservation easement, it is equally important that the land be thereafter managed to protect forest habitat and soils, in balance with low-impact public access. To that end a Management Plan — drafted originally by Arthur Westing, a forest ecologist on the Board of Trustees during the early formative years of the Pinnacle Association — is updated by Board members Andy Toepfer and Silos Roberts, both of whom are experienced in forest and ecosystem management, as new types of land are added. It is a comprehensive document, loaded with information about the land. It outlines the activities allowed and not allowed in the various types of ecosystems to be found on the Pinnacle Association lands. There are sections about types of northern forest stands, trail corridors, viewshed areas, plus the recent additions of a brook habitat and quarry area. While the Management Plan and conservation easements are restrictive, there are specific public-access uses allowed. The most well known involve the trails (over 20 miles of trails crisscross the forestland), which give thousands of users per year access for hiking, snowshoeing, skiing, biking, and fishing in the Ledge Road Brook. 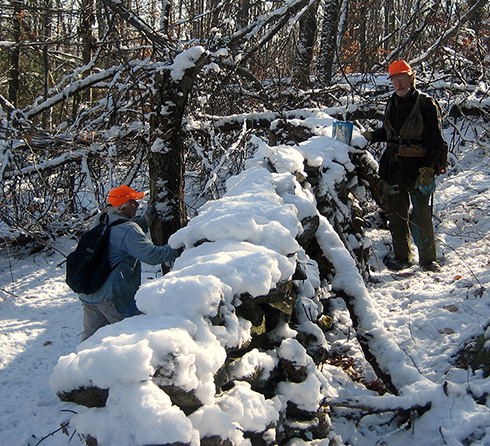 Hunting is allowed everywhere except for two properties: the Stephen Martin Memorial Wildlife Sanctuary off Bemis Hill Road in Westminster/Rockingham, and the Bald Hill Reserve adjoining the Bellows Falls Union High School land in Westminster. The Martin Sanctuary was bequeathed by the previous owner with strict prohibition against logging, hunting, dogs, or removal of any plant, animal, or artifact. Activities in managing the land have included a number of monitoring projects: species in vernal pools, furry mammals, ground-nesting birds, and winter deeryards. Antioch graduate students and high-school students have conducted specific area inventories and a study of landscape history in various locations. We have launched several projects to weed out invasive non-native plants, such as buckthorn. Erosion is a concern where trails or wood roads are located, and waterbars and ditching are installed where appropriate. In an effort to provide more abundant food for animals, we are releasing mast trees to invigorate nut production and are cutting trees and brush to create clearings to enhance food and habitat for deer browse and songbirds. There are restrictions outlined in the Plan to protect the forest habitats, and meet the conditions of the conservation easements. Restrictions include no residential development or new roads and no motorized vehicles, except for periodic trail maintenance and snowmobile use allowed on specific existing VAST trails in the Lake property in Grafton. Once a year, the Plan allows a special vehicle ride to designated sites for Accessibility Day, for people who otherwise cannot hike there on their own. There is no logging other than in a selected few areas and then only in a manner that will meet the overall goals. The Management Plan is approved by the WHPA Board of Trustees, the Vermont Housing and Conservation Board, the Vermont Land Trust, and the Current Use Conservation Program staff. Removing or controlling non-native invasive plants is a constant challenge. 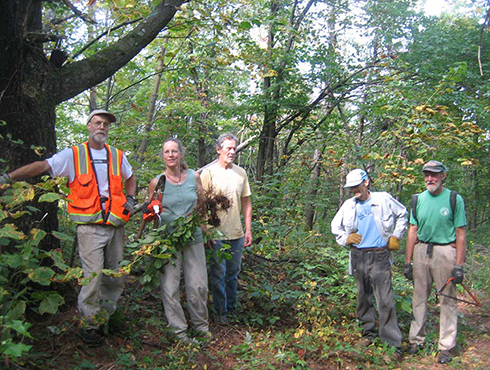 Special workdays are held each year to control buckthorn and other invasives. Even native plants, such as wild grape, can injure trees and require cutting back or removal.